Cool Runnings is a a relatively new addition to Bradley Beach. 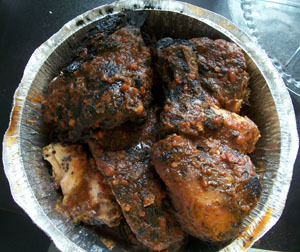 They offer Jamaican and pan-Island food options. Located on 123 Main St (heehee) I’ve tried them a half dozen times so far and have mostly positive feedback. Many people say it’s easy to miss. It’s in the same plaza as the Country Farms convenience store and across the street from Finn’s. My favorite items are probably the vegetarian patties. They’re hot, soft and full of peppery kick. I love the mix of veggies like cabbage, peas and carrots. The chicken patties while good tend to be a little drier. They offer a great $5 lunch special featuring curry chicken, goat, jerk chicken or jerk pork, rice and a soda.The jerk chicken gave a substantial kick, pushing yours truly near the limit of spiciness. The spice though was not without flavor. There were notes of smokiness and a mild sweetness in the sauce that helped to balance out the flavors. The meat is ultra moist and easily slides off the bone. The portions were great for the price point. I’ll be mentally prepared for the next jerk encounter. 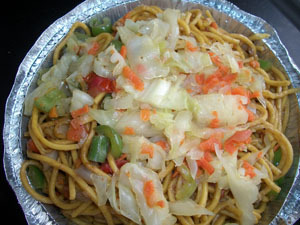 The chow mein was only $6. Unlike Chinese style, this was made of a cumin based sauce. While the portion was generous, it’s a little bland. They do load it nicely with veggies like beans and cabbage so you get a taste in every bite. Adding a heavy dose of salt, pepper and tapatio was helpful though. 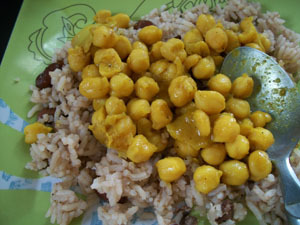 The chana ($6, chickpeas) is definitely worth trying. Fans of Indian food will recognize the word but the flavor is a little different. The first time there were pieces of spinach mixed in. Turmeric, cumin and heavy presence of lemon provided a lot of flavor. The most recent time it had a few sprigs of rosemary which worked oddly well with the turmeric and lemon. This dish is gluten free. Note that rice doesn’t come with it, so I’d suggest the delicious red pigeon peas and coconut rice. Cool Runnings is a good affordable option plus the owner is very helpful if you have questions. In the future I’m interested in checking out the Ackee and the cornmeal porridge among other items. Have you tried this place yet?